Lenovo's taking the wraps off of its newest ThinkPad here at Engadget Expand, but in fact, the T431s represents more than just a minor spec bump. It's actually the first ThinkPad borne out of Lenovo's latest "clean sheet" development initiative -- an 18-month process that the company briefed me on here. Regarding the laptop at hand, the 14-incher boasts a slimmer, sexier and more understated design, all while remaining very much a ThinkPad. It's being classified as an Ultrabook, yet it still meets the Mil-SPEC 8 standard for rigidity and durability. In other words, the weight loss isn't coming at the expense of ruggedness. As for specs, it's rocking a 1,600 x 900 matte display with 250 nits of brightness, integrated Intel HD graphics, a 720p front-facing webcam, 4GB of RAM (with optional upgrades boosting it as high as 12GB), a 47WHr (three-cell) sealed battery, an optionally backlit keyboard, Bluetooth 4.0 and built-in support for both WiFi and WWAN connections. It measures in at 13.03 x 8.89 x 0.8 inches while weighing 3.6 pounds, and it's easily one of the sturdiest Ultrabooks we've had the pleasure of wrapping our paws around. Around the edges, you'll find a full-size Ethernet port, a VGA socket (you know, for those aging business projectors), 3.5mm headphone / microphone combo jack, a pair of USB 3.0 sockets, 4-in-1 SD card reader and the removal of those conventional front hooks that have held a-many ThinkPad LCD lids down. The base unit ships with a 320GB (5,400RPM) hard drive, though big spenders can opt for a variety of SSDs. It'll ship with your choice of Windows 7 or Windows 8, and we're told that T431s models with touch panels will be on the horizon. As for the power plant? The base rig ships with a 1.8GHz Intel Core i5-3337U, while a Core i7 is available for the speed freaks. 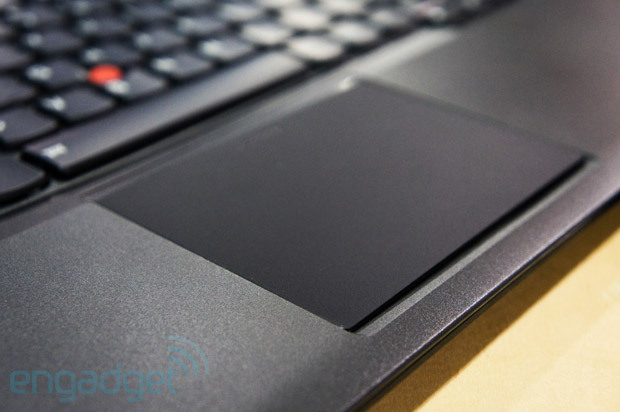 Perhaps the most notable change is the trackpad situation -- gone are the physical click buttons, and in is a custom-built alternative that took Lenovo and Synaptics some two years to hammer out the drivers. It'll support up to 20 different gestures, and you can read more about the behind-the-scenes building of it right here. Interested? It'll hit stores in April starting at $949. Follow all of Engadget's Expand coverage live from San Francisco right here!